Item as described, very happy with it! Thank you! Item was used and refurbished. Buyer beware! I own six generations of iPads plus a Mini and two Kindles. The latest model of Apple’s iPad Pro is the best so far. The 10.5 inch size is great. It’s bigger and still light with good battery life. 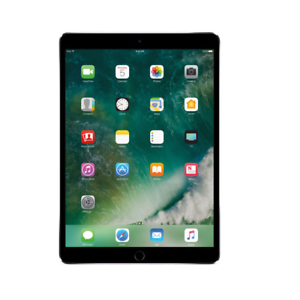 The screen has excellent viewing quality and together with Apple’s latest operating system, the speed and ease of the tablet is first rate. Great price for Apple quality! The iPad Pro exterior itself is in pristine condition, brand-new. There do not seem to be any defects with the functionality of the iPad Pro either. The charging cable and adapter were also brand new. I was nervous about the packaging as there was a cut right through the plastic over the iPad Pro screen. However, the screen is not damaged at all so the packaging defects are purely cosmetic. Great price for a quality Apple product. This iPad is awesome, very fast, fast, fast, love the size colors are awesome, I had the 12" iPad, it was just too big & awkward, heavy, to large to pack for a vacation. It lives up to expectations. There is a noticeable difference in speed and picture quality. The ability to use of Apple Pencil is great. The Apple iPad Pro is absolutely the best. I have the 10.5 (most popular) iPad with 256GB. It took little time to get used to it and figure out the its operation. I ordered the pen for detailed work I do. If you plan on or do art or fine detail drawings, electronic drawings, etc....get the pen. Its expensive..but well worth it! It does take some time to set up the iPad to your desire..but once its done there is almost nothing one can't do. Be forewarned...the connector is like no other. If you plan on printing or outputting to external ADAPTORS are required. You will have to purchase them separately. SD card for storage and transfers and a USB for printer. An iPad case would be wise.There is too much to say about it in the space. Don't forget to check out the refurbished and trade in units. If you can.......get one!! !